The first thing to consider when thinking about creating a pool room is the space. You need enough space to allow for players to shoot from all sides of the pool table. Here we help you consider what size room is needed for different sized pool tables. We are often asked about Regulation Size Pool Tables. This refers to a 4 1/2 foot by 9 foot table. It requires a much larger room than a 7 foot table as shown in the chart below. Standard 2 piece cues measure 58 inches in length. The pool room size needed then is the length of the pool table plus 2 times the length of the cue and the width of the pool table plus 2 times the length of the cue. Lets look at an example. You have a room with an available area measuring 16 feet 8 inches by 14 feet. This is 200 inches long by 168 inches wide. We know the length of our cue is 58 inches for each side of the pool table, or 116 inches, so the room length, 200 inches minus 116 cue inches equals 84 inches for allowed for the length of the pool table. The width of the room at 168 inches minus twice the cue length, 116 inches equals 52 inches allowed for the width of the pool table. Your space can fit a pool table 84 inches long and 52 inches wide. Standard pool table sizes are 7 foot, 8 foot, 8 1/2 foot and 9 foot long. Your space would best fit a 7 foot table. Here is a chart of standard table sizes and suggested room dimensions. 3.5' x 7' 16' 8" x 13' 6" 39.5" x 79"
4' x 8' 17' 4" x 13' 11" 44" x 88"
4.25' x 8.5' 17' 9" x 14' 1" 46" x 92"
4.5' x 9' 18' 4" x 14' 6" 50" x 100"
Keep in mind these dimensions are for using a standard 58" 2 piece cue. If you use a shorter cue you will be able to use a smaller space. Many homeowners would like to have a pool table in a lower level room but are hesitant because of a load bearing pole or beam in the way. Don't let this stop you. Most average homes have this obstruction. Here are some suggestions to help deal with that obstruction. Try to set up the your pool table so the obstruction is on a side of the pool table and not on the end. If it must be at the end of the table keep it at the end you break from, not the foot or rack end of the table. 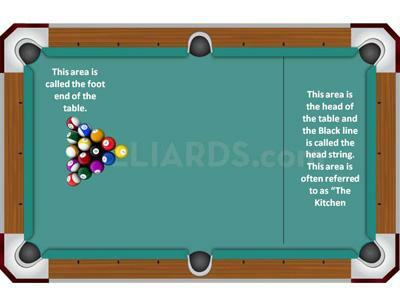 A lot more shots are taken from the rack end of a pool table and for break shots, the cue ball can be moved around to avoid the obstruction. If your pole is going to be on the side , make that nearest the head of the pool table, once again away from the majority of balls at the foot end of the pool table. Buy a shorty cue for those times the pole is in your way. Shorty cues come as small as 36 inches in length and are also available in 48 and 52 inches in length. You may want a couple of shorty cues which will give you additional options around the obstruction. The pool room you create will also need some accessories such as a rack for your cues, scorers and a place for spare balls. if you are playing a game of 9 ball and you need to set aside the 10 through 15 balls a combination score keeper and ball tray works great. Many of the wall or floor standing cue racks provide these storage options in one compact space. You will want to position these accessories in an area that does not obstruct play in any way. Wall mounted cue racks take up the least amount of space, and also add a decorative element to your pool room. If the primary use of your pool room is for Kid's you can fit a 7 foot table in a smaller space. Use cues that are only 52 inches in length. This option will provide good quality playing in a room that only measures 188 inches long and 156 inches wide. Even with obstructions you should be able to use and enjoy your pool room. Add some short house cues to accommodate shots involving the pole or corner wall that is in the way. Have fun!